Occasional wind, bloating, indigestion, heartburn and irregularity can affect all members of the family. A gentle enzyme product may be all that is needed to combat these irritating digestive complaints. Enzymes are key players in the digestive process. They help to maximize nutrient extraction and turn consumed food into energy. Enzyme deficiencies can lead to a variety of digestive discomforts, including occasional wind, bloating, indigestion and irregularity. These deficiencies may result from a combination of age, diet and lifestyle. For example, natural aging depletes the amount of enzymes available for use in the body. And when foods are cooked or processed, the enzymes contained within the food are destroyed, requiring the body to use its own enzymes to break down foods. Keeping up with the process of digestion can strain the body. Supplementing with enzyme products like Digest Complete can aid in the digestive process. Digest Complete is intended for the whole family as an introductory digestive enzyme product. Since it is a gentle formula, it may also be an excellent choice for individuals who have experienced sensitivities to high potency digestive enzyme blends. Digest Complete capsules are small, making them easy to swallow. Take 1 capsule with each meal. Do not exceed the recommended daily intake. 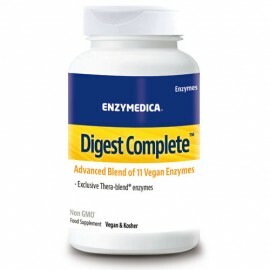 Digest Gold by Enzymedica is our most popular digestive enzyme supplement. Possibly the most potent formula on the market for digestive health, Digest Gold contains a broad range of enzymes including amylase, lipase, cellulose and protease which work to break down carbohydrates, fats, fibre and protein. Digest Gold also uses Enzymedica's patented Thera Blend process. Thera Blend combines multiple strains of enzymes that work in various ph levels, resulting in enzyme action that is three times stronger and six times faster acting than other leading enzyme products. Enzymedica Digest Gold has been America's #1 selling digestive enzyme for years, and is now finding a similar following throughout Europe. Enzymedica Digest Gold + Probiotics is Enzymedica’s most potent enzyme formula that breaks down..
Enzymedica Digest Gold is an advanced formula that breaks down carbohydrates, fats, fiber and p..